When done well, cottage gardens seamlessly blend colors, textures, forms and even fragrance. If you are not one to follow rules, cottage style may be your default. There's no concern for spacing, no worry about planting in odd numbers, no graduations in height. 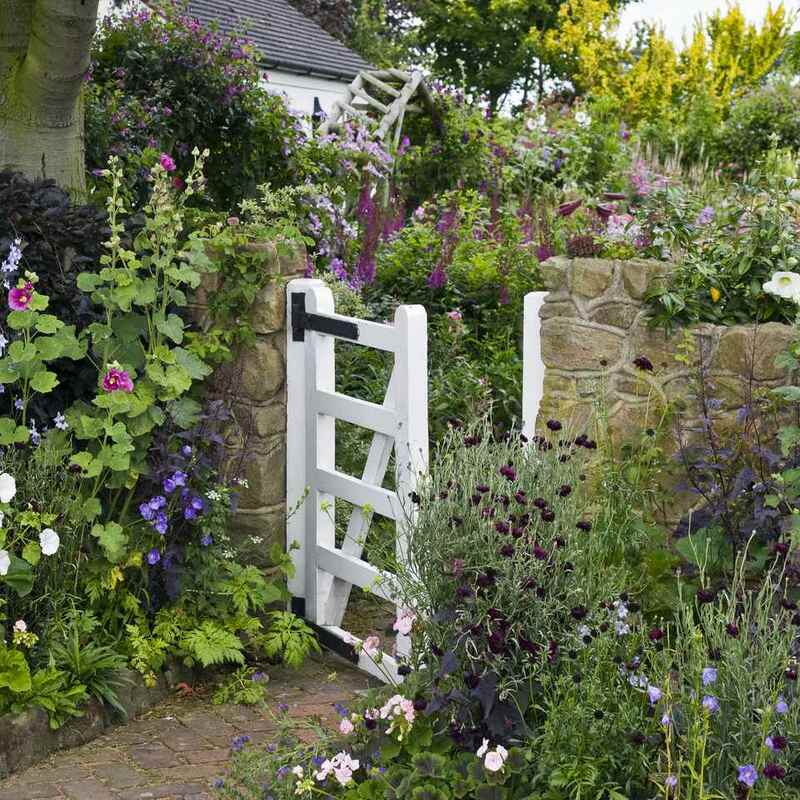 A cottage garden's greatest appeal is that it seems to lack any conscious design. But even a cottage garden needs to be controlled. Some of the most successful cottage gardens start with a formal structure and soften the framework with the lavishness of cottage plants. If there's a failing in cottage gardening, it's the idea that the garden can take care of itself. That is definitely not the case. In fact, a cottage garden can be high maintenance. Some flowers will become thugs, squeezing out others. Self-sowers can quickly get out of hand. Perennials will still need periodic dividing, or they will die out. With so many flowers, deadheading becomes time consuming, but the alternative is a lot of past-prime flowers. But the appeal of a cottage garden is easily apparent. The exuberance of flowers and fragrance welcomes you home and greets you every time you open your door. If you'd like to surround your home with a cottage feel, you can start simply, by putting a small bed on either side of the path or drive to your house and continuing to expand it over the years. From there you can add additional paths and seating areas and other personal touches. Personal: No two cottage gardens will be the same. Indeed, no cottage garden will be the same, two years in a row. The plants will keep moving around and the balance between them will ebb and flow. Inexpensive and Economical: Although you won't get an immediate impact, you could start a cottage garden with a few packs of seeds and some patience. Even if you splurge for some anchor plants, like rose bushes or flowering shrubs, you can temporarily fill in with less pricy plants. Self-sowers will quickly fill in and you can divide and multiply perennials each year. Find a friend or two with similar tastes and swap plants, to expand your palette. Doesn't have to be Perfectly Maintained: You will want to maintain some order in your garden, or it will quickly become tangled and overgrown. But it does not need to be immaculate. There is less chance of anyone noticing a couple of weeds or a plant that needs staking. Can become messy quickly. When plants choose where they want to grow, it can be serendipity or chaos. You have to be ruthless about thinning out volunteer plants. If you become sentimental over every bleeding heart seedling, you will soon have an over abundance of bleeding hearts. Better to share them with a friend. It can be hard to find space for new plants. This can become a major problem if you want to start growing more vegetables in the garden. Better suited to a full sun site, where you will get more blooms. Keep it on the small side. An expansive cottage garden can look like an untended garden. You need a good mix of plants, to keep it from looking blurred or jumbled. Start by planting large clumps, so it's not just a jumble. Repeat both plants and colors, to create a flow and harmony. Don't forget to add tall plants. You don't need to worry about putting them in the back, as you might in a border, but you do want the eye to move up and around, rather than viewing one flat plane. You will still want some paths, for access for weeding, places to sit and views. Choose path material to complement your garden and home. Traditional materials include: bricks, stone, gravel and dirt, but you could even use your paved walk or drive. Keep a bit of lawn, to break things up. Let plants spill over each other and onto the walkways. Add some structure with small trees, shrubs or obelisks covered in vines. Consider adding some focal points when you first begin the garden. Strong feature plants, like shrub roses, flowering trees and shrubs will prevent the look from becoming blurred and gauzy. Evergreens give any garden a sense of structure. If at all possible, give the garden a backdrop. Hedges, rustic fences or even a wall, will serve as a background that brings the garden into focus. Don't expect it to look the same year after year. Let the plants be active partners in the creation of your garden. Be sure to include some fragrant flowers. If you live in a hot, dry climate, don't be afraid to substitute Mediterranean plants or succulents.